Netherlands native, Milko Van Gool, arrived in the Catalina Channel already an accomplished marathon swimmer, having set a men’s record in the North Channel in 2013 and holding another record for the fastest swim across Lake Malawi in Africa. Milko also has an English Channel swim under his belt, among other notable swimming accomplishments. Today, he set another milestone by becoming the first Dutchman to swim across the Catalina Channel, which he completed under rocky conditions in the unofficial time of 9:26.01. 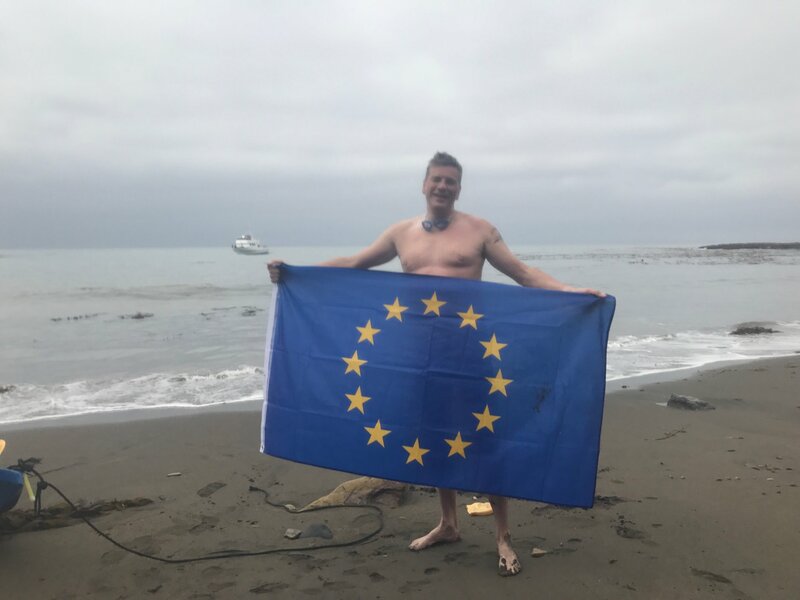 Milko proudly displayed the flag of the European Union while posing with crew members, Milan Van Gool and Dan Simonelli on the mainland shore after completing his swim. Julie Bender and Roxie Hipolito observed the swim for CCSF. Congratulations on your outstanding accomplishment, Milko! Geen reacties op "Milko is de eerste Nederlander om het Catalina Channel over te zwemmen"